30-150AD: Church organization the same as in the Bible Blueprint! 30-150AD: Church organization the same as you can read about in the Bible Blueprint! The simple bible blueprint of church organization where a group of equal elders (presbyters) govern only within their own local church meeting the full qualifications of 1 Tim 3 and Titus 1. 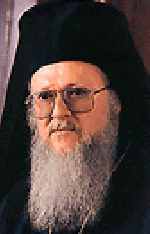 30-150AD: No trace of the Roman Catholic papal or the Orthodox patriarchal systems. 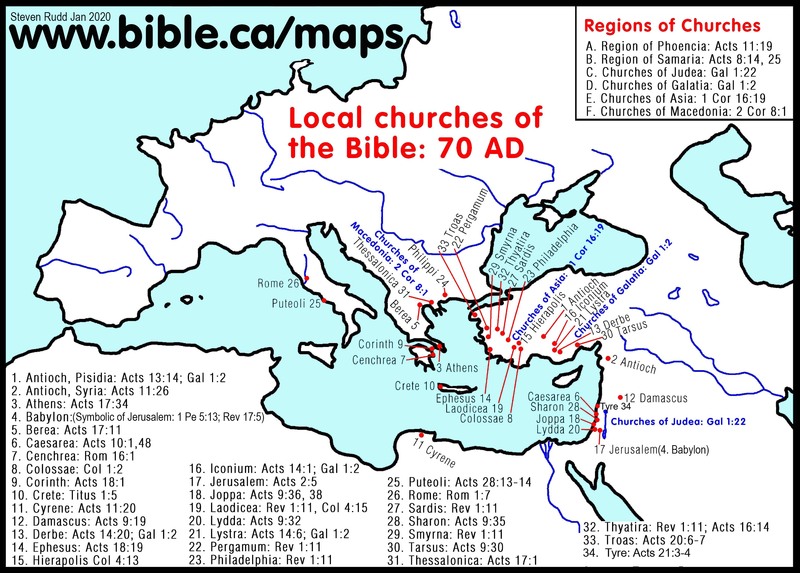 Notice that the neither Rome or Italy are mentioned as a region of churches. This proves that the bishop of Rome really was not a central authority during the first century. While mentioning four other regions of churches, God never even gave Rome honorable mention. Of course, just because these 4 regions are mentioned, does not mean they are centers of power. Rather, they are natural collections of churches within already defined provinces. We do the same today, by referring to the churches in provinces and states as a group, even though we understand there is no corresponding hierarchy of power. It would clearly be a mistake to assume the church in 70 AD was divided up into four territories like that of the 4th century Patriarchs! This is the stage where what history records is identical to what we see in the Bible. Each local church had a plurality of men who shared the single office which was called by two terms: Overseer (Bishops) and Elder (presbyters). The Bible refers to this office collectively as the "Eldership/Presbytery" in 1 Tim 4:14. Of most importance, before 150 AD, is the fact that Bishops (Overseers) and Presbyters (Elders) were the same office and used interchangeably. Each church had more than one Elder/Bishop, all of whom were equal in power. There was no organization larger than the local church that bound local churches together. In this way, each local church was organized as a "congregational oligarchy". Not only was each Bishop in each local church equal in power, so too, each local congregation had equal power world wide. In practical terms, each local church had control only over itself, and over no other church. There were no organizational ties between local churches and one set of elders in a local church never had any control over any other local churches. Each local congregation was self-governing under Jesus Christ as its head. The concept of a diocese (groups of local churches ruled by one bishop) and even more so "mother churches" (patriarchs), simply did not exist in the Bible. Historically, it wasn't until about 150 AD that we first see a single bishop ruling over the local church. But even in 150 AD, he had no control over other local churches. It wasn't until about 250 AD, when the first diocese began to develop, that these solo bishops began to exercise power outside the domains of their local congregations. This proves false, the Catholic and Orthodox claim of being the apostolic church. 492 AD See Jerome below. Notice that Jerome documents in 492 AD, that overseers and elders are the same office, and that local churches had more than one. In spite of the practice of the day in 492 AD, Jerome looks back, in same way we can today, and comments on what the Bible says! This is powerful, because Jerome admits in 500 AD, during the age of the 5 patriarchs, that local churches were governed by a plurality of elders. He also admits that the Bible teaches the office of elder and bishop are the same office. E. Contrary to bold and historically unsubstantiated claims of the Roman Catholic church, the names of the first Bishop's of Rome is unclear. And why not! During this time in history, the church of Rome was governed by a plurality of elders who were also called bishops! The modern idea of a pope, even the idea of a single bishop ruling a local church, did not exist!